Photo Watch 2 is the most versatile watch face for your Android Wear 2 watch! Upload your own photos and setup any complications on the watch face! The photo will show up as background on the watch face! It is that simple! • add interactive complications to your watch faces! • customise text (including emojis) – add special message for your love one! 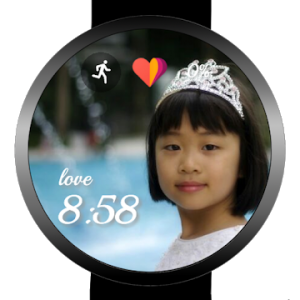 3 watch faces provided: Photo Watch, Photo Analog and Photo Digital. • Upon installed on phone, you should received notification to install app on watch. If you did not received the notification, go to Play Store on watch and scroll down to download the app in “Apps on your phone” section. • Some watches will received the images and changes slowly (from a few seconds to minutes). You can simply wait for the changes or try again. If you encountered any issues, please let us know!